Take a look at the history of straight razors, in the beginning people would use knives and sometimes their swords to shave their beards and heads, then in the 17th century came the straight razor, specially made for shaving beards and head. With time, their working and mechanism improved. In 20th century, safety razors were invented and I have to say they were quite a useful invention. In the past few years the mechanism of safety razors have been improved, advancements have been made and now people prefer electric razors. But some people like you and me, still prefer the old school straight razors. This article is about the best straight razors. So sit tight and read carefully…. Buying something feels like such an easy task but believe me it’s not, in fact, sometimes it’s the most difficult task. Straight razors, for instance, might look simplistic but there is more to them then meeting the eye, e.g. you have to look at the material the blade is made from, the design, the blade width, style and many more other factors. Below are some of the factors I think you should consider while buying straight razors. Blade type: Straight razors with blades that have a semicircular design and the end points are round is more forgiving than other types which makes it perfect for the beginners. Straight razors with blade that have a square-ish design and have sharp end point is particularly used for shaving small areas and requires experience. Straight razors with blades that has a French point profile i.e. a quarter circle and ends in a sharp point like square blade, it is often used by experts. Blade width: A blade width is the distance between the back of the blade and the shaving edge. Blade width is measured in increments of 1/8. So a 4/8 is a blade with a width of half inch and a 8/8 is a blade with a width of 1 inch. The specialty of smaller blades is that they are easier to strop whereas larger blades are useful in aggressive shaving but not so good at shaving hard-to-get spots like under the nose. Modern vs Vintage razors: If you love old school stuff and love to keep them for a long time then vintage razors are your best option. They require great care and once they are restored beginner you should first use the modern razors and then use the vintage razors if you want to. Modern straight razors, as the name implies are modern they have advanced mechanism and they are used by many people. A modern straight razor is better than a vintage razor but a well maintained vintage razor and a modern razor have the same quality. Temper: There are two types of razors, a hard temper razor and a soft temper razor. A hard temper straight razor keeps its edge for a long time while soft temper razors are easier to sharpen. Grind: A full hollow grind makes the blade lighter and sharper and not so suitable for beginners whereas a less hollow grind is not so sharp and good for the beginners. Now that you have read all the factors that you should consider while buying a straight razor, we should proceed to our top 8 best straight razors. The list is based on some of the best straight razors in the world. This straight razor is made of stainless steel and is black in color. Unlike others this razor wont rust or lose its color. The blade is 4 inches long so it will cover large area while you are shaving, it means it will take less time in shaving as compared to other razors. The blade have a well-fitting handle that prevents accidental injuries. This feature makes it secure for you and especially the beginners. Those who have used this product before, say that this razor says sharp for a very long time. This means you don’t have to worry about sharpening it. A lot of users say that its strong and classy. Produces a shave with a stunning design. Comes with a classy velvet case and a stylish leather bag. Needs sharpening before being used. Will need to invest in a strop. I think this straight razor is the best straight razor. It has all the features one requires and it is safer to use as compared to other straight razors. Second in my list of top ten straight razors for men is Dovo best straight razor. The Dovo Company is well known for its products. And this product in particular, has been named the best quality razor. Now you will be asking that why is this product named as Dovo best quality razor….well my friend, after reading the below features you will get your answer. This simple straight razor is made of strong Swedish steel and the handle of the blade is made of strong durable plastic. The design of the razor is plain. After being professionally sharpened this razor can cut through anything and by saying anything I don’t mean literally anything….the last thing you would wanna do is trying to cut a wall by a razor…hahah joking. This straight razor is the best go-to option for those who want to have a strong plain razor that can offer a satisfying shave every time they use it. This razor is made for both the beginners and the experienced. It is easy to use, secure and doesn’t require much effort while shaving. 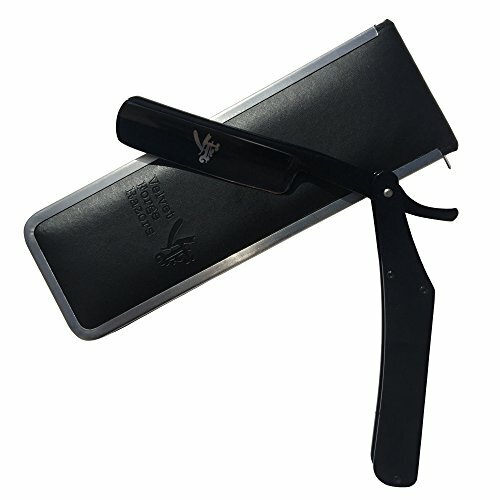 Its one of the most facilitating straight razor. Buyers are very satisfied with this straight razor and as mentioned before, this straight razor is classy and very easy to use. 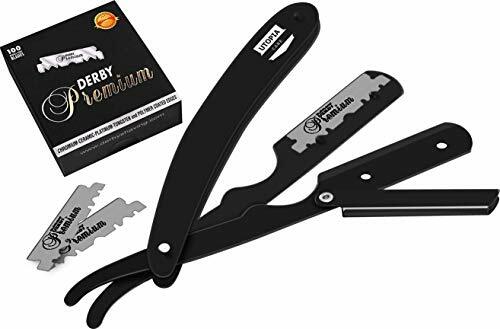 Those who have used this product say that this razor is able to give you 15 or more shaves before it needs to be sharpened, so you don’t have to worry about sharpening it time and again. Some users have mentioned that since the handle is made of plastic, it sometimes slip in hands and there is a reasonable chance that you might get yourself injured with the blade so be careful. You have read its features, its pros, its cons and so have i. I would say that this product is perfect for beginners as Dovo’s product are said to be beginners friendly. Although expensive this product is highly durable and very stylish. So it lives up to its price. 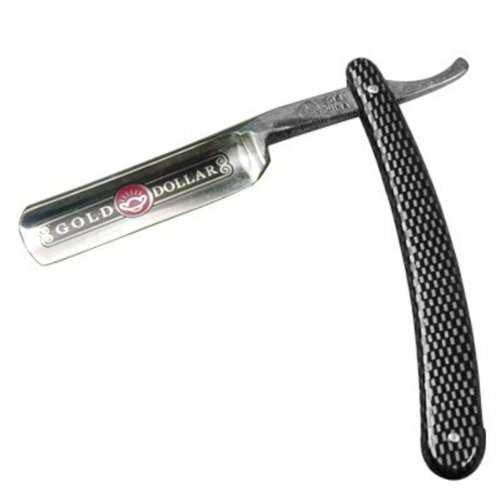 3rd in my list of top 8 straight razor is Gold dollar 208 straight razor and for a fine reason. Here are some of the features. 5/8 which allows it to offer you many shaves before being sharpened again. This product is well known for its shape and design, many people buy it because of its cool design. This razor might not look much but believe me it’s very powerful razor that can cut through anything, once professionally sharpened. This razor provides one of the most satisfying shave. And it’s also famous for being a brilliant back-up razor. This razor is also cheap which makes it much affordable. Some users use this razor as a back-up razor. 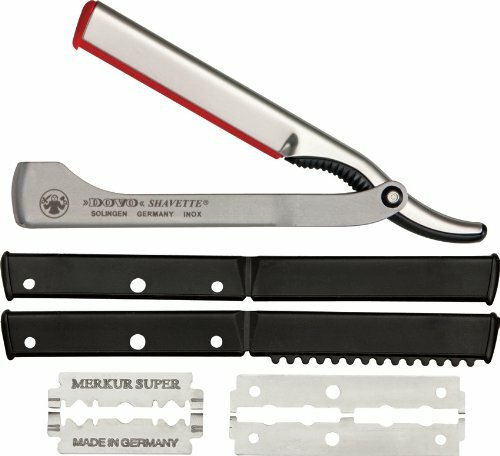 This razor is perfect for the beginners as it is cheap so one should buy it and use it to get experience and then upgrade to higher level once they have learned all the techniques of shaving with straight razors. Can be kept as a primary shaving razor. Working is not as good as other razors. This product is very stylish and is well known for its cool style. Although famous, this razor is still not good at doing its work i.e. shaving. It’s also used as a back-up razor in case of any emergency. 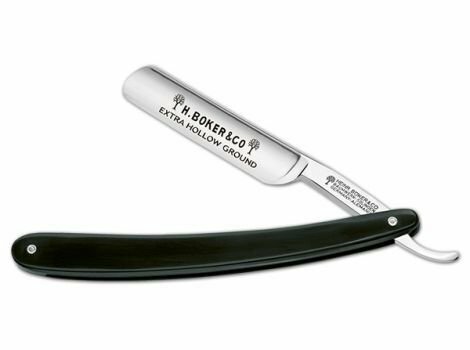 4th in my list of best straight razor is Boker straight razor as we all know Boker is a well-known company and so are their products. This product of Boker is no different than others. Here are some of the features it has. Boker straight razor has a strong plastic handle and the blade is made up of alloy blend that has silver in it. The material used in the blade makes the blade more strong and unique than other straight razors. This hygienic razor blade has silver in it and silver is naturally anti-microbial so that’s a plus point. This material used in the blade makes it more hygienic and safer to use. The handle is design in such a way that you will find no problem with handling the razor while shaving. It can be used by users of all skill levels. Buyers say that this straight razor is one of the most unique and efficient straight razor they have ever used, they say that the razor is hygienic and the design is pretty dope. Some users say that they find the handle a bit slippery and advise others to handle the razor with more care. You have to strop it before using it. Ever heard of disposable straight razors, I guess not, well gentlemen this straight razor is also known as disposable straight razors. Here are some of the features of this so called disposable straight razor. This shavette razor is made of stainless steel so if taken care of, this razor can last for longer. It has a matte finish which makes it look smoother. The folding of the razor keeps you protected all the time. The blade is changeable so you can change the blade when it loses its sharpness. When you use the razor, simply wash it and dry so that it’s ready for use again. The blade in the razor is adjustable, so you can change the razor whenever you want to. The razor is stainless so it can last for long if you keep it clean and dry. The way of the folding of the razor ensures your protection. This razor is more safer to use. Buyers are very satisfied with this shavette razor. They say that it’s more convenient to use than other straight razors. Some say that its more difficult to learn its curving. Difficult to learn the use. This straight razor is one of the most user friendly straight razor you will ever find. It is the best go-to option for barbers and users of all levels. It is secure. The parkers are well known for their products. And this product is also very well known. This straight razor is also a shavette like the one mentioned before. Here are some of the features, this product have. This lightweight shavette razor is made of stainless steel. It’s easily transportable. It uses round blades to ensure you don’t hurt yourself while using it. You can use both half and full length blades in it. Changing blades doesn’t changes its performance. Razor is lightweight so it can be transported easily. Its design ensures that you don’t get hurt while using it. You can use blades of all shapes in it. People who have this razor before, recommends that you should use it with more care because the blades it uses are very sharp. They say that if you are unfamiliar with using shavette, you should first learn how to use them. Take great care while using it, you might get yourself hurt. This shavette is one of the best shavette I have ever used it lightweight and it is easy to transport. I would advise that those who likes travelling should at least try it once. Shavette are well known across the world and then shavette being a product of Dovo is like icing on the cake. Here are some of the features it has. This shavette base is made of aluminum which makes it strong and easier to keep clean. It can handle both the half-length and full length blades which enable you to shave all kind of spots. It comes with two types of guides, one for using half-length blade and the other for using full length blade. It is easier to use and clean. You can shave all types of spots with it. It has two guides with it which will allow you to learn how to use it. It’s safer to use as compared to other straight razor. Those who have used this product before, say that what they like the most in this product is its feature of handling all size of blades. The blades that are advised by manufacturers are quite cheap which makes this product overall cheap. Some users say that they found it lightweight. Some might find it too lightweight to use. In the end I would say that this straight razor is the best go-to option for those who wants a cheap straight razor which is also easier to use and provides great shave too. Japan’s products are well known in the world and so is this product. This straight razor has taken the straight part too seriously and that you will find out when you use one. This straight razor has a bit awkward design. The handle doesn’t fold, in fact, nothing folds up at all. Its handle is made of strong plastic and its body is made of strong stainless steel. Its spring muted head enables you to switch razors easily. It uses feather brand blades. This straight razor is made in such a way that its sturdy and its super easy to use. This razor uses feather brand blades that can be found everywhere. This razor comes with a head cover so you don’t have to worry about storage problems. The razor is super easy to clean. 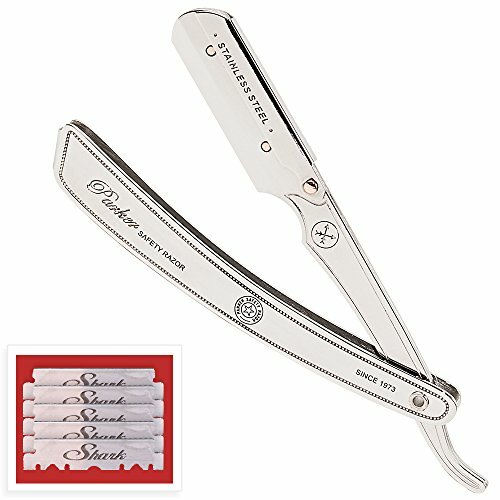 People who have used this product before say that this products is one of the best straight razor they have ever used. They say that it is easy to clean. Some buyer say that the technique of using this straight razor is different than other so you have to use It carefully. I thinks its design is awkward but still it is easier to use, its sturdy and its stainless so I would advised everyone to try it. But do take great care while using it as this razor is not like other straight razors. Shaving with a straight razor is totally different than shaving with other types of razors. You to be more careful and experienced. Here are some of the fundamentals of straight shaving. Now you have to apply the shaving cream to your face with a shaving brush or you could use your finger but I would suggest you to use the brush. Everybody’s way of handling the straight razor is different but the more secure way is to put you pinkie on the tang of the razor while putting the first three fingers on the back of the razor. Rest your thumb on the side of the blade. Always use the razor slowly and gently no matter how experienced you are. Always shave in the direction in which your hair grow. Always use you non-shaving hand to draw the skin tight while shaving with the other hand. Start with a side of the face. You should tilt you head back before shaving under your skin.